One of my favorite things about NOLA was the amazing food scene. We had plenty of delicious seafood, creole delights & beignets, but our favorite meal was none of those things. The best meal we had in New Orleans was in a converted home turned restaurant tucked into the Uptown neighborhood, miles away from the French Quarter. 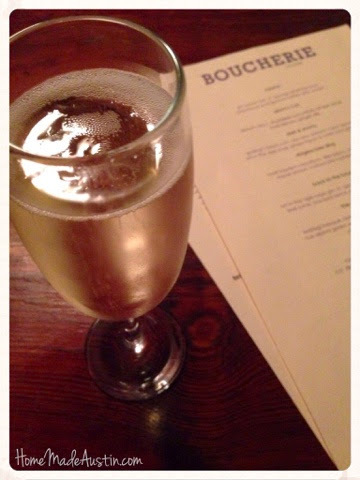 We decided to visit Boucherie after reading Joy the Baker's page on her NOLA favs. I am so glad I looked at her page. Boucherie is cute & casual, with all the charms of a small restaurant, but their food was big & bold. 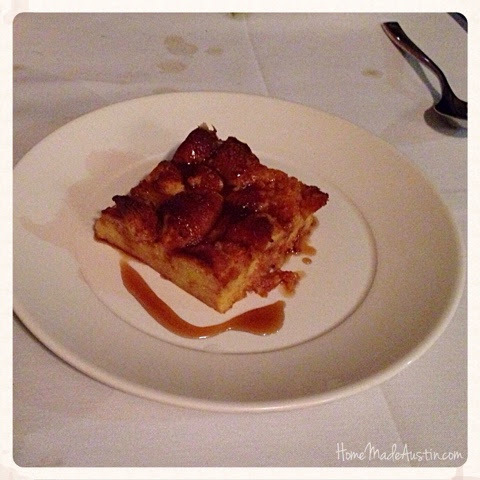 Everything we tasted was unexpected but wonderfully comforting & the staff was full of Southern friendliness. From the moment we opened the door, everyone we encountered was warm & talkative, which I can appreciate as a Texan & my husband, who would have a pleasant conversation with just about anyone, loved. We started out the evening waiting at their 4 seat bar with a glass of prosecco & good conversation with the bartender. I have to warn you, the photos you about to see are not the best ones I have ever taken. We went to Boucherie well after dark & I have not yet perfected my 'night time' photo skills, so please know that the food is 1,000 times better than anything looks in these pics. Our first tastes were a couple of small plates, including the one above, which was a special for the evening. 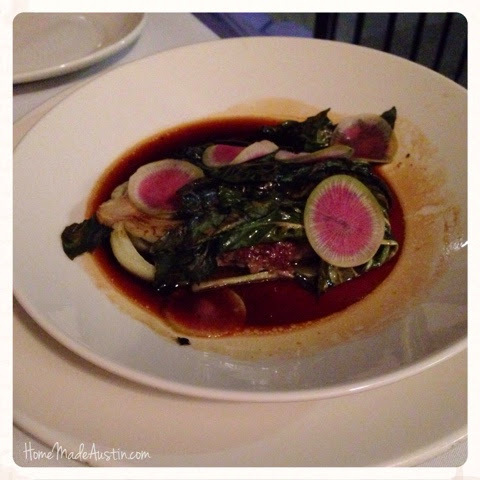 It was local raised beef, stuffed inside of bok choy with a rich sauce and watermelon radishes. Yum. The flavor was rich & smooth, & that beef was so hearty. Along with the beefy goodness, we had a plate of collard greens & grit fries. I know now that you have not truly had grits until you have had fried grits. Wow, the crispy crust & still creamy inside of those fries, oh my. The bed of sauteed collards was dressed in a strong beef infused gravy that just screamed Southern comfort. This dish was a great blend of tradition meets modern meets call your Mom delicious. Next up were the large plates. These did not disappoint. 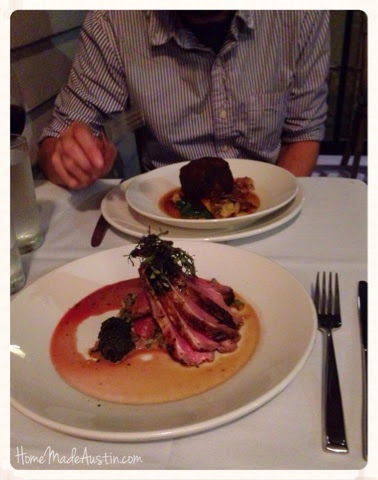 Andrew's Pulled Pork Cake with Fingerling Potato Confit, Sauteed Kale & Smokey Jus was fun, inventive & so tasty. The pulled pork was juicy & tender, the potatoes were crispy & the whole thing just worked. My Pan Seared Duck Breast, with Crispy Pea & Vegetable Succotash with Peach & Almond Pesto was divine. 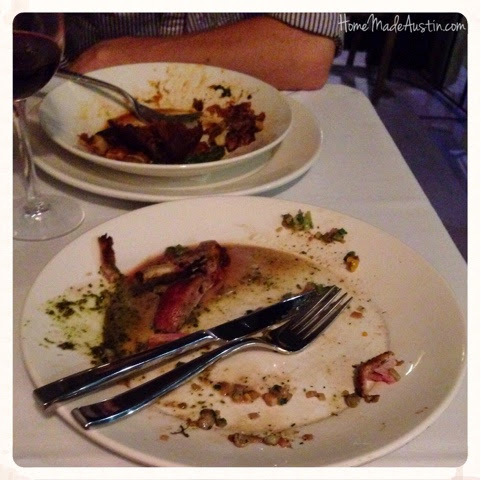 I've never had a more well cooked piece of duck & the pesto was a wonderful bite of freshness that I used to top off every bite of meat. The crispy peas & succotash were a nice contrast. As you can see, we ate everything down to the very last bite. Even though we were stuffed beyond belief by the time we were through the entrees, we just couldn't pass up the Krispy Kreme Bread Pudding. This take on a Southern favorite was the perfect end-of-meal treat. The top had just a bit of crunch & the inside was very soft & creamy. And if you're thinking that it would sickeningly sweet, you'd be wrong. It was surprisingly not anywhere near as 'sugary' as I was thinking, just rich. Oh so rich. One piece was just right for Andrew & I. If you are anywhere near the New Orleans area, check out Boucherie. It's a can't-miss.